We are constantly looking for new alternatives, new improvements, new products that can make the daily routine of our Merchants better, that can make them grow. For that, we asked ourselves, what is the perfect product to help Merchants understand how their business is doing and can also give them enough insights on how to perform better? 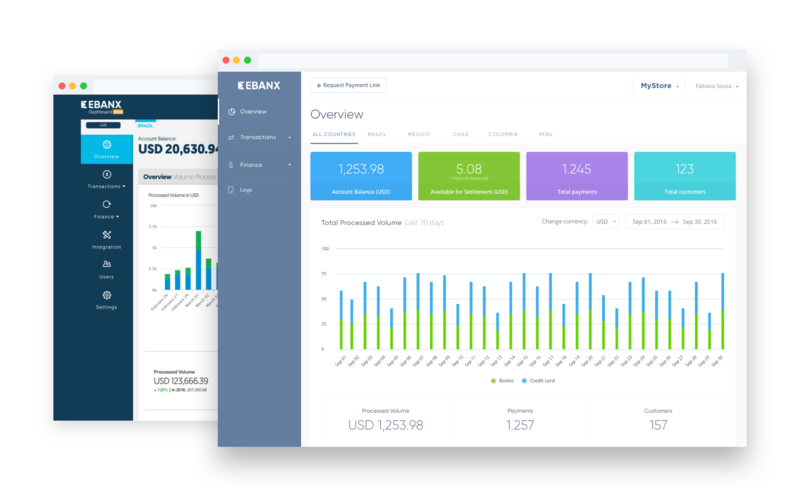 Made to make Merchants’ experience with EBANX easier and more efficient than ever, the EBANX Dashboard it’s the evolution of our old Merchant Area. This 2.0 version comes with a new look, new functionalities, and a better usability. To build the platform, we have collected more than 500 feedbacks about our previous platform and every opinion given made a difference in the construction process of this project. Inspired by the minimalism and the simplicity, all screens gained a new look, making the usage experience more soft, comfortable and intuitive. Go from Sandbox Mode to Live mode just on a switch of a button, literally. Locate any transaction such as Payments, Refunds or Chargebacks. Get your Integration Keys in a simple and easy way. Want to know more about the new Dashboard? Sign up or Log into your account and check for yourself! To guide you on your usage, download the Guide below and discover what have changed, what are the new features and more.